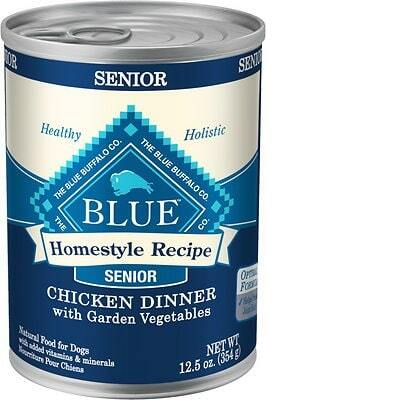 Blue Buffalo Homestyle Recipe Senior Chicken Dinner is a mid-priced wet dog food with overall average quality. This product has one controversial ingredient but (very positively) includes no artificial preservatives, colors or flavors. The food has well-balanced amounts of protein, fat, and carbs and also excellent meat and fat quality. However, Blue Buffalo has an above-average number of dog food recalls. The company was also not completely open when answering our quality and transparency questions. The average dog food we reviewed has 39 total ingredients, with 1 controversial ingredient. This product does have Carrageenan which is a controversial ingredient. You can read more about it below. 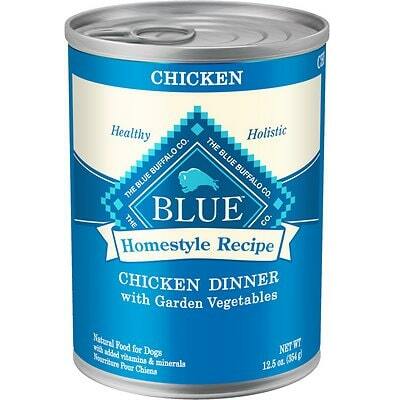 Blue Buffalo manufactures their dog food in the United States. This product uses the clearly named meats - Chicken and Chicken Liver. This is excellent because it shows us exactly which animal sources these ingredients come from. Beyond these two main meat ingredients there is also Chicken Broth and Flaxseed which are named sources for fat. Just like with the meat sources its a sign of quality to see specifically named sources like in this Blue Buffalo product. No artificial flavors are used in this product either. Not using artificial preservatives, color or flavors is a reliable indicator of quality. This brand has had far above the average number of recalls. We’ve summarized recent dog food recalls below.